A group of friends provides the city’s home bakers a way to kick-start their small or home-based businesses while at the same time jumpstarting their own. Baking is a lucrative skill. Whether you have a home-based setup, a neighborhood shop, or a mall outlet, baked treats can bring in big profits. If you’re a home baker, however, one challenge is reaching your target market. That’s the same problem that Joanne Tan, a home baker herself, had to deal with. “We usually just sell at bazaars around December. After the Christmas season [are] lean months for us,” explains Joanne. So how can home bakers gain more traction in the market? 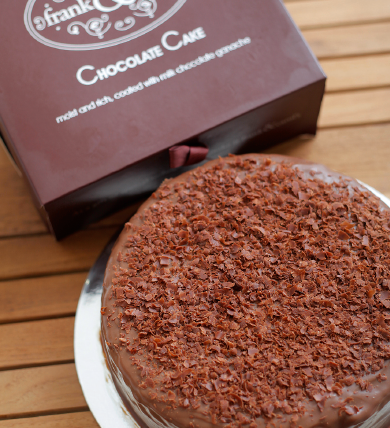 By gathering the best-selling goods from the metro’s home bakers under one roof---that’s how. Together with her friends Paul Tan, Ian Cheng, Jeffrey Go, and Richard Uy, Joanne put up Parvati, a dessert haven located at the Mindanao Lobby of TriNoma Mall in Quezon City. Believing there is strength in numbers, Joanne and her partners thought of building a store where talented but unknown home bakers could regularly sell their goods. The arrangement would be similar to a tiangge: the group would own the store, charge home bakers a fee for space in the store, and get a commission for every unit sold. In August 2009, the group took their idea to potential ’renters.’ They visited bazaars around the city and searched social networking sites for home bakers who had yummy products and were interested in their proposition. By November of the same year, they organized via Facebook a taste-testing event that brought together 50 home bakers who showcased 250 different products, which in turn were evaluated by about 600 people. In the end, 51 desserts from 30 home bakers made the cut. At that point, the group had already signed an agreement with TriNoma to open Parvati. The owners poured in P3 million of their own savings as starting capital and after a month of construction, Parvati opened on May 1, 2010. The focal point of the store is one wall that has been fitted with refrigerators and drawers, which are covered with big stickers of the home-baked desserts. This is the owners’ way of addressing the issue of providing equal exposure to all the goods they carry. “We have a lot of home bakers, and we charge them the same placement fee whether their products are on the top or bottom shelf,” explains Joanne. So to be fair, the stickers of the desserts are moved every month, giving each sweet treat enough time on an eye-level shelf space. Keeping tabs on inventory was another challenge posed by Parvati’s concept. “At the end of every day, we have to give each home baker an inventory report of their own desserts. Then at the end of every month, we have to release paychecks to them,” says Joanne. 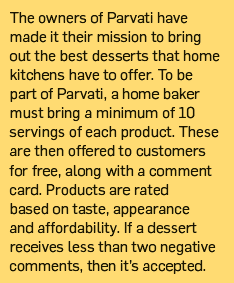 To address this, the five friends hired a firm that specializes in developing point-of-sale (POS) systems and commissioned them to customize one for Parvati. But beyond inventory, the owners take care of each baker. They identify the 10 low-selling items based on daily inventory reports, and then make it a point to push those desserts the next day.